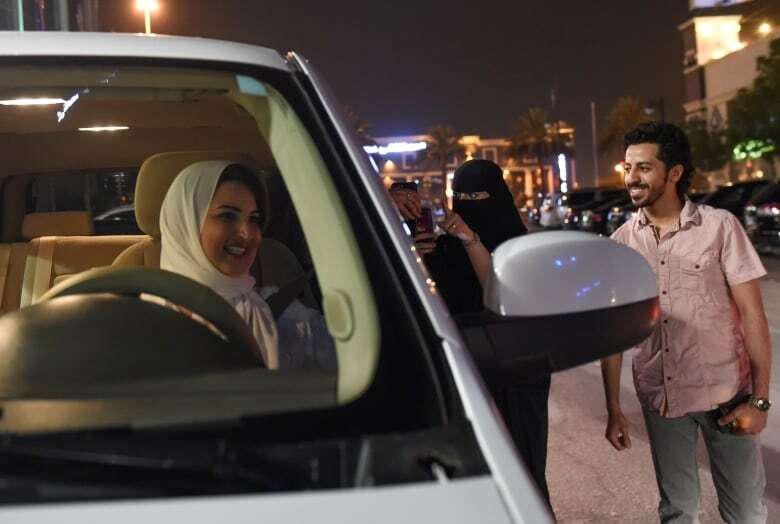 Saudi women are in the driver's seat for the first time in their country and steering their way through busy streets just minutes after the world's last remaining ban on women driving was lifted. Saudi women drove to work and ran errands on Sunday, relishing the freedom to move about without relying on men after the kingdom lifted the world's last remaining ban on women driving. It's a historic moment for women who have been at the mercy of their husbands, fathers, brothers and drivers to move around. The ban had relegated women to the backseat, restricting when they could meet friends, where they could spend their time and how they could plan out their day. "It feels beautiful. It was a dream for us so when it happens in reality, I am between belief and disbelief— between a feeling of joy and astonishment," said Mabkhoutah al-Mari as she pulled up to order a drive-thru coffee on her way to work. The 27-year-old mother of two is a driving instructor for women and already had a driver's licence from the U.S., where she'd spent time in Tennessee studying. But on this morning, she drove freely in her hometown of Riyadh for the first time. As she prepared to set off on the road, her older brother sent her off with a kiss on the forehead and a wave. For most of her life al-Mari relied on drivers hired by her family, and she and her sisters had to co-ordinate drop-offs and pick-ups. "Now, thanks to God, I can plan out my own schedule and my errands and my daughters' errands," al-Mari said. Some women didn't wait until the morning to drive, jumping in their cars at the stroke of midnight and steering their way through the capital's still busy streets. "I'm speechless. I'm so excited it's actually happening," said Hessah al-Ajaji, who drove her family's Lexus down Riyadh's Tahlia Street after midnight. Al-Ajaji had a U.S. driver's license before obtaining a Saudi one and appeared comfortable at the wheel as she pulled up and parked. As for the male drivers on the road, "they were really supportive and cheering and smiling," she said. While there was never explicitly a law against women driving in Saudi Arabia, a ban was enforced by police and licenses were not issued to women. The driving ban had been a stain on the country's reputation and hindered women's ability to contribute to the economy. In 1990, during the first driving campaign by activists, women who drove in Riyadh lost their jobs and were barred from travelling abroad, even as women in other conservative Muslim countries drove freely. Three of the women who'd taken part in that 1990 protest and several others who campaigned years later for the right to drive were arrested last month, just weeks before the kingdom lifted its ban. Some have since been temporarily released. Three of those still detained— Aziza al-Yousef, Loujain al-Hathloul and Eman al-Nafjan— are seen as icons of the women's rights movement in Saudi Arabia. They had also been calling for an end to guardianship laws that give male relatives final say over whether a woman can marry, obtain a passport or travel abroad. The government has accused them of vague crimes, including working with "foreign entities" to harm the interests of the kingdom. Their arrest, however, appears to send a message that only the king and his powerful son and heir will decide the pace of change. Although women can now drive in Saudi Arabia and don't need male permission to obtain a licence, most will still need the support of a father or husband to drive. As she drove through the streets of Riyadh, Ammal Farahat, a mother of two, said every effort or risk taken over the years has made a difference and led to Sunday's change. "It's like they say the ocean is made of little drops of water and that's exactly how I feel today. It's the efforts of everyone, little drops of sweat," Farahat said. Not all women are driving at once, though. 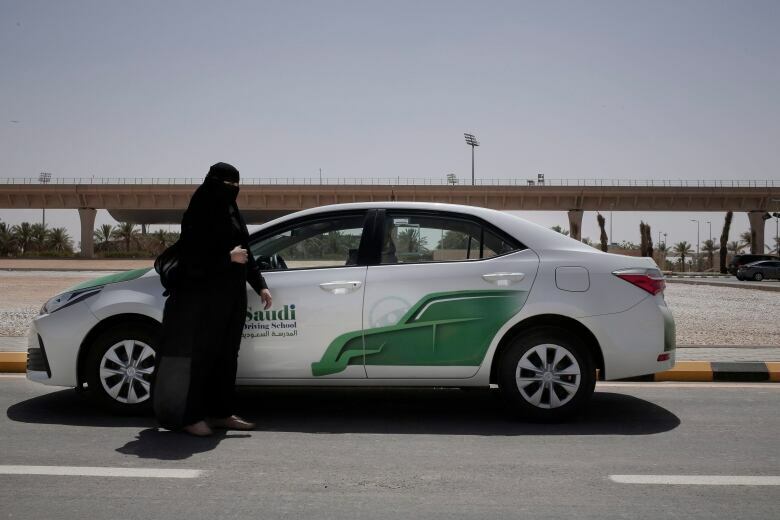 The overwhelming majority of women in Saudi Arabia still don't have licences. Many haven't had a chance to take the gender-segregated driving courses that were first offered to women only three months ago. There's a waiting list of several months for the classes on offer in major cities. And the classes can be costly, running several hundred dollars. Other women already own cars driven by chauffeurs and are in no rush to drive themselves. In many cases, women say they'll wait to see how the situation on the streets pans out and how male drivers react. "I will get my driver's licence, but I won't drive because I have a driver. I am going to leave it for an emergency. It is one of my rights and I will keep it in my purse," said 60-year-old Lulwa al-Fireiji. "I see that this decision will make women equal to men and this will show us that women are capable of doing anything a man can do," said Fawaz al-Harbi. "I am very supportive and in fact I have been waiting for this decision so that my mother, my sisters will drive."